1 Members of Pasadena's Valley Hunt Club organized the first Tournament of Roses Parade in 1890. They wanted to share the beauty of the southern California climate. Ostrich races were among the events of some of the first celebrations. There was also a race between a camel and an elephant. The elephant won. Two thousand people were in attendance at the first year's celebration. 2 The Hunt Club felt the event would be a great way to celebrate the flowers that were in bloom in Pasadena while many other states in the U.S. were shoveling snow. 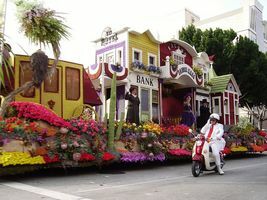 The festival included a parade of marching bands and floats. Each year it grew bigger and better. It wasn't long before eastern newspapers began reporting on this colorful event. 3 By 1895, the Tournament had grown so much that a Tournament of Roses Association was formed to take charge. In 1902, the association decided to add a football game to the festivities. Even though their season was officially over, Stanford University and the University of Michigan accepted the invitation to play. The University of Michigan tromped Stanford so badly (49-0) that Stanford gave up in the third quarter. The football game was a disappointment. The following year chariot races were held instead.